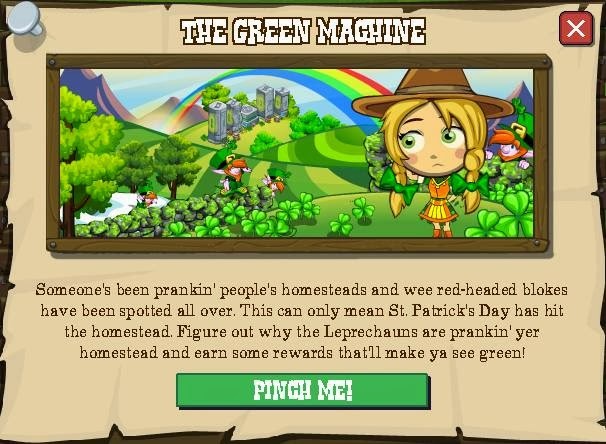 It's time for an inrush of the colour green, little guys with red hair, pranks and gold at the end of rainbows, yes, it's St Patrick's on the homestead! 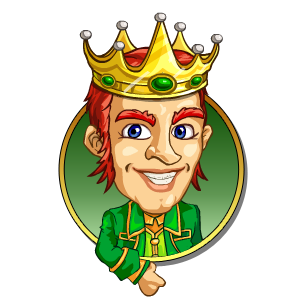 This year, not only are the Leprechauns back with a vengeance they've decided to bring Royalty along with them! 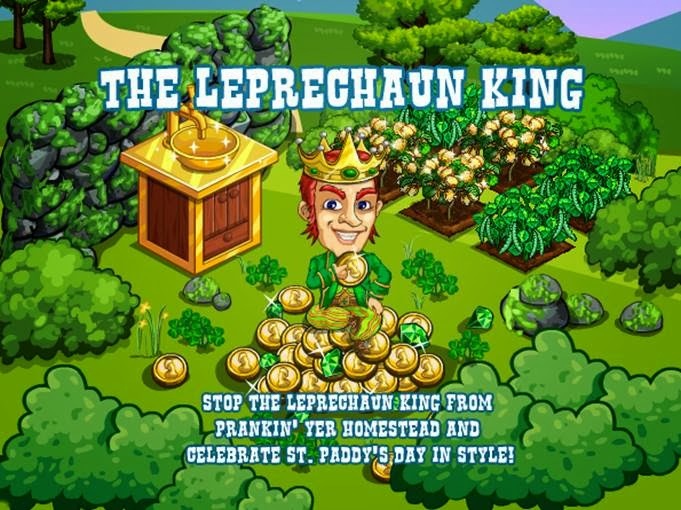 So get ready to not just deal with the pesky little troublemakers in green but also the troublemaker-in-chief, who's love for the shiny stuff means we're going to have the chance to trade some gold coins for various goodies, including boosts and horseshoes! As usual, we'll see a popup to start! That will kick off a 5 mission thread with a Monday wrapper (all details HERE) and a 4 step build, the Runed Ruins! (all details HERE). So, what are we going to be doing, eh? Well, for starters yes, those pesky Leprechauns are back so we're going to be tracking them down! They'll drop from various crops, the new Green Beans, Red Cabbage, Potatoes and, of course, Clover. Once found we'll need to pacify them with 5 wall post items, Uilleann pipes. But, as I said earlier there's a whole new member of Leprechaun society in the frame now, the Leprechaun King! The King is connected to the Runed Ruins and also the four Runestones that help give him power, so if we can line them up right we can negotiate a special little deal, coins for some of the rubbish he's got lying around gathering dust... like Animal Vaccines and, something he's never quite understood... shoes, for HORSES... whoever thought of such a thing..? 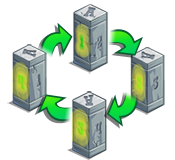 As you can see there are four Runestones A, B, C and D. Each of those can be spun like wheels in a padlock to show 1, 2, 3 or 4. 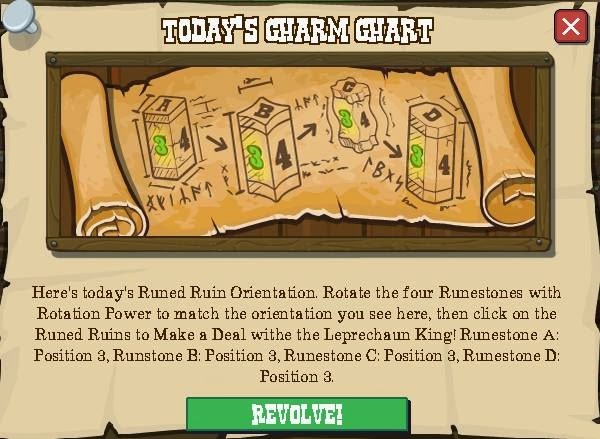 Simply make the Runestones on your stead look like the ones i the Charm Chart and BAM, we get to deal with the Leprechaun King by giving him coins and in return, depending on how much we give, he'll give us stuff! 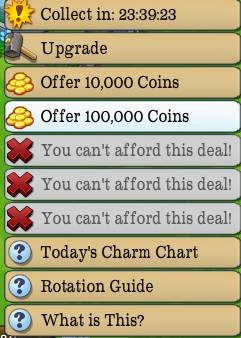 ...and, thanks to mission rewards, a pair of new outfits for the green lovers among us! So, what are you waiting for? Leprechaun nets at the ready! Who is That Masked Man? !